Fabulous luxury 3 bed 3 bath villa on quiet exclusive development , with huge balconies, garden and stunning views, A/C, BBQ, 110sq mtrs pool near traditional Turkish village and historic sites. A beautiful house sleeping 6 to 7 (including travel cot) on an exclusive secluded private development with glorious mountain views. It is within easy striking (by car) distance of many superb archeological sites. 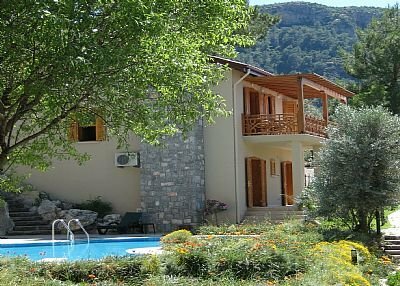 The villa and its location is particularly suited to people wishing to have a secluded peaceful holiday. It suits walkers and those wanting to lie in the sun equally. Within walking distance (8 mins) of a traditional Turkish village with shops and restaurants. It is surrounded by lovely gardens designed to a high specification. Full air conditioning, 2 ensuite bedrooms with 3rd bedroom and bathroom, private parking, a patio and private garden area as well as extensive balconies. The pool is 3 times the size normally offered with villas (110 sq m). The cluster of villas is easily accessible but tucked away in a private location with lovely woodland walks straight from the doorstep. The villa is not suited to the party lover, although much fun can be found in the village. It is our home, not just a rented house, and the furnishings etc reflect that. The main living area is open plan and spacious with a large mezzanine study above and a "cathedral ceiling" in polished cedar. Furnishings and fittings are of a high quality and feature an open fireplace. There are books and DVDs for guests use, guides, cookery books, and of course - broadband. The kitchen has dishwasher, large fridge, gas hob and electric oven. There are views all round from the extensive balconies both to the living/dining/kitchen area but also from the main bedrooms. The pool is large (110sq metres), and the gardens are extensive, planted with fruit trees, and with a waterfall feature. The villa is only 5 minutes drive from the 5BC Roman ruins of Kadyanda (Cadianda) to which there is a walk through the forest. A quick downhill walk takes you to the attractive traditional Turkish village of Uzumlu which has most regular shops, a selection of restaurants, a weekly market, and an hourly bus to the town of Fethiye so a car is not absolutely essential, but is desirable in the height of summer, and if you want to make the most of the surrounding sites of interes..
Glorious mountain views surround the villa in this exclusive secluded development. The living area and balcony are mainly upstairs with superb views. The living area is extensive with a mezzanine for a study/additional bedroom/playroom area. The garden has a private area and a private patio to one side, as well as the area around the large shared pool (only 4 other villas).